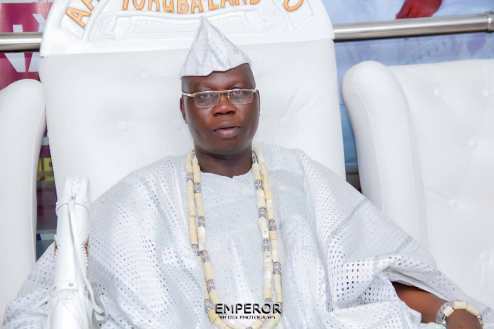 LAGOS MARCH 15TH (NEWSRANGERS)- The Aare Onakakanfo of Yorubaland, Iba Gani Adams, has sent words of sympathy to the families of the victims of the collapsed building in Ita Faji, Lagos. Adams, in a statement he personally signed on Friday, expressed sadness over the death of the pupils in the ill-fated building. “My heart bleeds at the number of casualties, and the sorrow I feel now is overwhelming, seeing the ways they were being evacuated from the rubbles of the building. “Cases of building collapse should be addressed holistically to forestall future occurrences. “At the same time, there is the need for the state government to address the issue of building collapse urgently in the state. “It is becoming too frequent. “There should be standard in what we do as a people. “That is how it is done in other climes. “Many of the buildings in Lagos, particularly on the Island, are old and dilapidated. Adams urged the state government to step up its activities in building low cost and affordable houses for Lagosians so that residents can live comfortably rather than living in buildings that can collapse anytime. “The government must also ensure that private schools in the state are duly registered and that they are located in a befitting and conducive environments,” he added.